WayMakers would like to commend this prayer guide, Hindu World Prayer Guide 2018 (which is published by worldchristian.com), and has made it easy to order from WayMakers online or by phone. Join Christians around the world in prayer for our Hindu neighbors near and far. 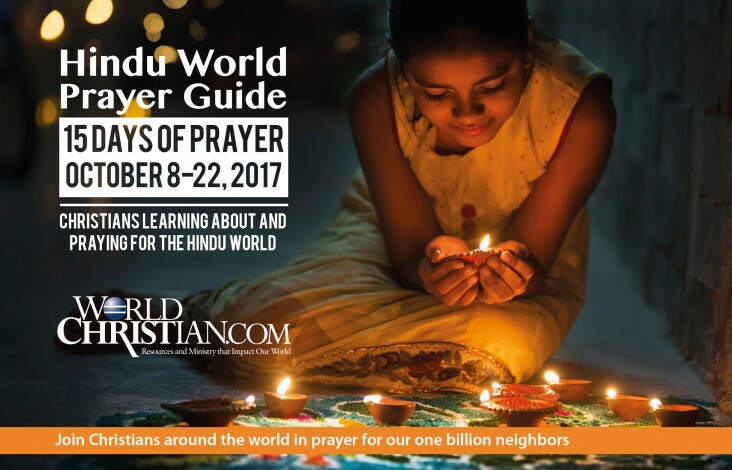 The new annual Hindu World Prayer Guide calls Christians and churches worldwide to take 15 days from October 28 – November 11, 2018, to learn about and pray for our world’s more than one billion Hindu neighbors. This time period also encompasses the significant Hindu Festival of Light (Diwali). Hindu peoples are precious to God and so let’s be diligent in our desire that Christ be made known to them. As we inform ourselves about how to pray for Hindu people, we will be asking God that they come to faith in Christ and experience His gift of salvation. Each day focuses on a specific issue or area of the Hindu world. As you read through it and pray, you’ll gain a better understanding and a heart for Hindus, which transcends the news headlines. Full-color, 32 page booklet. Click to enlarge a sample page: These sample pages are from the 2017 edition. Please call for discounts on orders greater than 500 copies. Order soon. Limited quantities of these prayer guides are available from WayMakers. For questions or to order by phone, please call WayMakers at (800)264-5214.